Kelowna is the largest city in British Columbia's Okanagan Valley with a population of 98,000. Surrounded by green forested mountains merging with lush orchards and vineyards overlooking the sparkling waters of 82 mile long Lake Okanagan, Kelowna is a natural choice for visitors. Kelowna also ranks as the 24th largest metropolitan area in Canada. 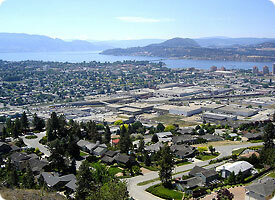 Kelowna is the seat of the Regional District of the Central Okanagan, the third-largest metropolitan area in British Columbia (after the Lower Mainland and Victoria), and the largest in BC's interior. With scenic lake vistas and a dry, mild Canadian climate, Kelowna is a desirable place to live and has become one of the fastest growing cities in North America. The appropriate management of such rapid development (and its attendant consequences) is a source of significant debate within the community. Kelowna is the second most expensive housing market in Canada (behind Vancouver). Because of Kelowna's unique climate in Canada, it is often referred to as "California North." Kelowna has a diversified economy with large industry employers such as Sun Rype Products and Riverside Forest Products, as well as many small and medium sized businesses. There is also a growing high tech sector as entrepreneurs and employees are attracted to the lifestyle and accessibility of Kelowna. Kelowna was ranked first with the overall lowest cost to do business out of the six cities compared in the US and Canada, in the KPMG Pacific Region - Competitiveness Alternatives Study. Over 2,000 hours of sunshine and only 13' of precipitation annually allows for a wide range of outdoor activities including golfing, hiking, mountain biking, water sports, winery and agricultural tours and many cultural events. Spectacular mountain scenery, pristine lakes, and sandy beaches -- this is Kelowna. For years, only one major highway passed through the city of Kelowna: Highway 97. The road itself is good, but its connections to all points east and west in the province were only managed by using the slow, curving Trans Canada Highway and the Crowsnest Highway. As the Okanagan Valley is a popular getaway for residents in Vancouver, a new freeway was built into the BC interior in 1986, eliminates over two hours of travel time between the two major destinations. This freeway, starting in Hope, is known as the Coquihalla Highway, and terminates in Kamloops. This new freeway system makes the drive from Vancouver to Kelowna just under four hours, at 425 km in distance. Kelowna is connected to Westbank by the three-lane Okanagan Lake Bridge which links Highway 97 south. The floating bridge is slated for replacement as it has outlived its usefulness and is incapable of supporting the current traffic levels. The construction of a new bridge -- William R. Bennett Bridge -- has begun, although there has been a lot of controversy surrounding the project. Delays and connectivity are some of the major issues, since the highway leading up to the bridge is only four-laned and is not a freeway. Kelowna has an International Airport north of the downtown core, with regular flights to and from Calgary, Edmonton, Toronto, Vancouver, Victoria, Las Vegas, Honolulu and Seattle, as well as seasonal service to Mexico.